Experience a diverse assortment of ceramic art in one, central location! Visit downtown Davis, CA, April 27-29th, when it transforms into a mecca of over fifty exhibitions within a four-block radius, with an educational conference with lectures, workshops and demonstrations. In an intimate setting, you can interact with top artists in a way not possible at other venues. UC Davis, home to the late sculptor Robert Arneson, was instrumental in defining a new direction for ceramic art. Enjoy delightful downtown Davis and be inspired by nationally recognized ceramic art talents. This year’s conference will feature captivating lectures and hands-on demonstrations from celebrated artists: En Iwamura, Shenny Cruces, Gerit Grimm ,Kevin Snipes, Michelle Gregor, Mark Burns, and Lisa Clague. 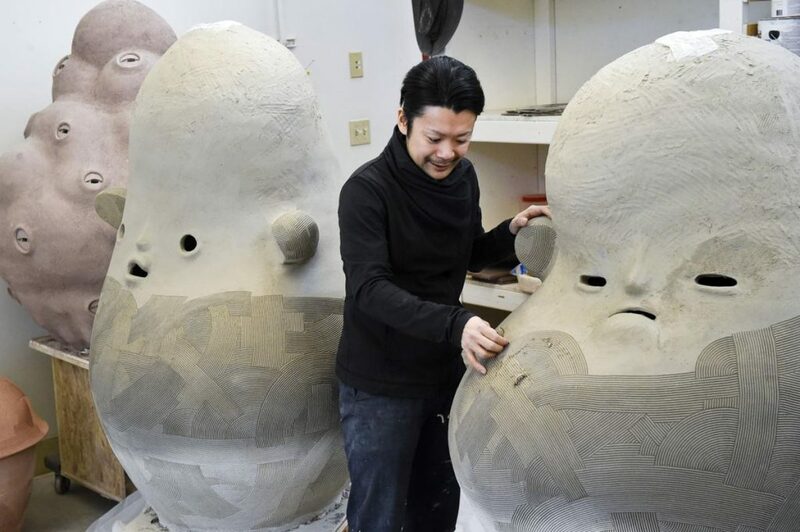 En Iwamura believes ceramics has the potential to be an international language and is one that can cross different cultures, people, and countries. Iwamura will discuss and demonstrate his installation artwork. Shenny Cruces is renowned for her delicate work with porcelain. Kevin Snipes will demonstrate a variety of techniques that he uses to produce his wonderfully colorful, layered, intricate surfaces using the traditional techniques of mishima, sgrafitto, underglaze and slip decoration and discuss how he uses these techniques in nontraditional ways to explore pop culture, contemporary life, narrative and art. Gerit Grimm will demonstrate how she makes her wheel thrown figure sculpture that reference myth, narrative works from historical paintings and self-portraits. Michelle Gregor sculpts the abstracted human figure in ceramic. Continuing the tradition of artists such as Manuel Neri and Stephen DeStaebler , Gregor’s forms apply the free, intuitive impulses of Abstract Expressionism to figurative representation. Mark Burns explores societal norms of sexuality and identity through his humorous and often absurdist sculptural forms. Lisa Clague is an internationally known ceramist who uses metal and clay to create mythical figures and creatures. With over 40 participating schools from throughout California, CCACA is one of the largest and most diverse ceramic events in Northern California. Demonstrations, lectures, student exhibitions—no other event delivers more inspired knowledge of ceramic sculpture for a better price. Meet face-to-face with distinguished ceramic sculptors you might only read about; see and hear from the artists what makes them top in their field. This is a chance to surround yourself with the top ceramic art and artists of today and the ideas of the artists of tomorrow. 10am-9:00 pm Over 40 student and professional exhibitions will be up throughout downtown Davis.